New research shows that bus rapid transit (BRT) systems like Rio de Janeiro’s TransOeste (pictured) have a wide range of benefits for quality of life in cities. Photo by Benoit Colin/EMBARQ. Around the world, cities are searching for sustainable ways to transport residents quickly, efficiently, and safely throughout their streets. One such solution is bus rapid transit (BRT), which is already widely implemented in both the developed and developing worlds. New research shows that BRT can reduce travel time by millions of hours for commuters worldwide. For instance, BRT users in Istanbul, Turkey, can save 28 days per year by shifting from other transport modes to BRT. Commuters in Johannesburg, South Africa, meanwhile, can save an estimated 73 million hours between 2007 and 2026. That’s the equivalent of more than 9 million eight-hour work-days. BRT is a city-based, high-speed bus transit system in which buses travel on dedicated routes. A new report from EMBARQ, Social, Environmental and Economic Impacts of Bus Rapid Transit Systems, examines global evidence as well as four in-depth case studies of BRT systems in Bogotá, Colombia; Mexico City, Mexico; Johannesburg, South Africa; and Istanbul, Turkey. It concludes that BRT improves quality of life in cities in at least four key ways: saving travel time, reducing greenhouse gas (GHG) and local air pollutant emissions, improving traffic safety, and increasing physical activity. Dedicated bus lanes separate BRT buses from mixed traffic, allowing them to travel more quickly through a city. Pre-paid boarding and level platforms – reminiscent of a metro station rather than the traditional bus stop – speed up passenger boarding, while traffic signal management that prioritizes BRT buses and high-frequency bus service minimizes waiting times. These features have a significantly positive impact in cities where BRT systems operate. In Johannesburg, BRT users save an average of 13 minutes each way during their daily commute. In Istanbul the savings are even greater – the typical Metrobüs passenger saves 52 minutes per day. Mexico City stands to save US$141 million in regained economic productivity as a result of travel time reductions from Metrobús Line 3. In terms of quality of life, travel time savings is perhaps the most important benefit of BRT systems: it allows passengers more time to live, not commute. BRT reduces the overall amount of vehicle kilometers traveled (VKT) in a city by shifting commuters to high-capacity buses that can carry up to 160 passengers at a time. Fewer vehicles transporting the same amount of passengers reduces traffic congestion, and presents the opportunity to replace older, more polluting vehicles. The incorporation of modern fuel efficiency technologies into BRT buses and better driver training can also contribute to lower fuel consumption and emissions. These cleaner vehicle and fuel technologies lower the concentration of ambient air pollution citywide and inside BRT vehicles. Passenger exposure to air pollution at stations or inside buses is further reduced by shorter travel times, meaning cities have a major opportunity to reduce local air pollutants by implementing BRT systems. For example, Metrobús Line 3 in Mexico City is poised to eliminate more than 2,000 days of lost work (due to illness), four new cases of chronic bronchitis, and two deaths per year, saving the city an estimated US$ 4.5 million. Implementing BRT systems contributes to reductions in traffic crashes and fatalities in a few key ways. First, an overall reduction in VKT results in fewer drivers on the road and a safer transport environment for drivers, pedestrians, and cyclists alike. Second, dedicated bus lanes reduce interaction between buses and other vehicles, minimizing the risk for traffic crashes. Finally, BRT can change bus drivers’ behavior by reducing on-the-road competition with other vehicles and providing opportunities to improve driver training. The case of Latin America showcases BRT’s safety benefits: streets with BRT systems saw an average 40 percent reduction in fatalities and injuries. Further evidence suggests that BRT and other forms of sustainable transport are an under-acknowledged component of traffic safety planning, with an enormous potential to reduce traffic crashes and save lives. BRT systems also increase physical activity for passengers, thanks to the spacing of BRT terminals, which tend to require longer walking distances than private vehicles and other motorized modes of transport. Despite the distance, shorter overall travel times make BRT worth the walk, with passengers across the world consistently moving through the city faster even with more time spent getting to terminals. Mexico City’s Metrobús passengers walk an average of 2.75 minutes more per day than before the city implemented its BRT system. Users of Beijing’s BRT system have added 8.5 minutes of daily walking as a result of the BRT. Because the World Health Organization recommends adults aged 18-64 do at least 150 minutes of moderate-intensity aerobic physical activity throughout the week, BRT passengers already have a jump start on a healthy lifestyle just from their daily commute. 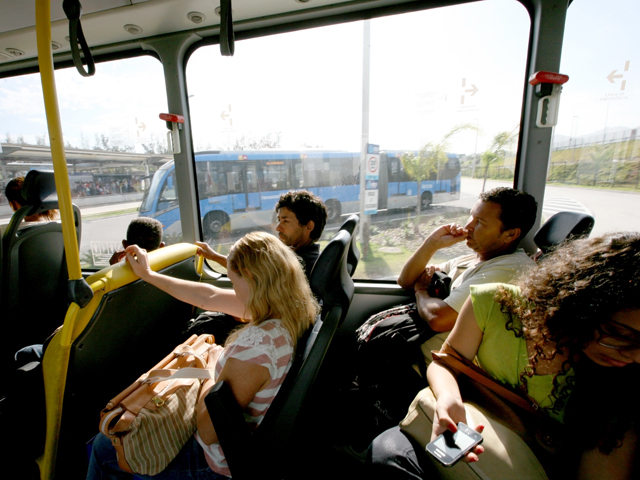 As a growing transport solution in both developed and developing countries, BRT and busway systems already have a combined daily ridership of more than 29 million people in 163 cities around the world as of October 2013. An additional 143 BRT systems are currently being implemented or expanded. This new analysis supports the global scaling up of BRT systems, in addition to offering recommendations for policymakers, technical experts, and financing bodies to maximize the benefits of BRT. As a safer, cleaner, and more efficient mode of transport that gives people more time for their personal lives, BRT is a smart solution to cities’ urban transport challenges. For more on the benefits of BRT, check out this newly released video, which takes an on-the-ground look at BRT systems in Mexico City and Istanbul. Robin King is EMBARQ’s Director of Urban Development and Accessibility and a co-author of the new report, Social, Environmental and Economic Impacts of Bus Rapid Transit Systems. She can be contacted at robin.king@wri.org.